When you're the country's favorite radio comedian, you tend to have a lot of friends. And those friends can't wait to have you stop by for a visit, crack a joke or two, play a fiddle solo, or even step out of character for a rare dramatic turn. Such was the case with Jack Benny. Consistently near the top of the rating charts with his own program, Jack was a popular guest artist on dozens of different series. 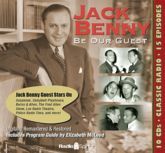 We have collected fifteen of his greatest guest spots for this collection, including digitally remastered broadcasts of Suspense, Campbell Playhouse, Burns & Allen, The Fred Allen Show, Lux Radio Theatre, Philco Radio Time, and more!